RBM Lumber in Columbia Falls, Mont., is a small, family-owned mill that is a pioneer in a brand new kind of timber economy, one that would restore rather than deplete forests and create low-volume, high-value wood products in a sustainable way. The Idaho Conservation League's John McCarthy talks about the tremendous changes coming to the Northern Rockies forests. Teresa Catlin, an ecologist and forest consultant, says that her community forestry project is coming together because locals want much the same thing. Hunter, naturalist, writer and logger Bob Love talks about practicing wild forestry. Forest Service veteran and now chairman at a collaborative forestry group, Tom Kovalicky, describes his enthusiasm for his forest stewardship projects. Evenlyn Thompson of RBM Lumber talks about working for sustainable forestry. RBM Lumber is not your typical forest products firm, but others could learn a lot from it. Now that the big timber companies are abandoning the Northern Rockies, the region must decide what to do with millions of acres of cut-over land. 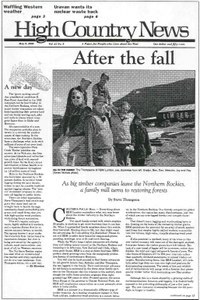 The writer, who works for the Forest Service, is optimistic about the possibility of restoring forests and sustaining logging communities. The writer describes the wonderful, fascinating, unique people one can encounter if one gets out of the automobile and shares the bus with others. Red Rock Mesa, an artists' community, will offer studio space and cabins for all kinds of artists who wish to spend time near Zion National Park in Utah. A report from the Montana Human Rights Network says anti-Indian groups are on the rise in Montana. Bart, the famous acting grizzly, is the spokesbear for Colorado State University's Animal Cancer Center's new research facility, following the bear's own recent brush with cancer. The BLM says that burros are better than llamas, goats or horses in the backcountry, and is encouraging people to adopt wild burros from Arizona and train them. Colorado State University, Department of Engineering, seeks one-page abstracts for next January's Conference on Tailings and Mine Waste. The National Park Service and Department of Interior are sponsoring a conference to help land managers on the Colorado Plateau in July. Volunteers are being sought by the Forest Service for the Rocky Mountain region. Environmentalists and Steelworkers Union members have formed the Alliance for Sustainable Jobs and the Environment to fight unsavory corporate practices. Look at that big plant! Some fertilizer sold in Washington since 1998 contained uranium and other nuclear wastes. The video "Ancient Forests: The Power of Place" is designed to educate people to the harm done by logging in the Northwest's old-growth forests. If all works out, grizzly bears may be reintroduced into the Northern Rockies' Selway-Bitterroot Wilderness Area in as little as a year. The Telluride MountainFilm Festival, set for Memorial Day weekend, celebrates the outdoors in a compelling variety of ways through filmmaking. "Living on the Earth" by Alicia Bay Laurel, a counterculture handbook for back-to-the-landers, is back in print 30 years after it first appeared. A guide of schedules of Native American pow wows across the nation is offered through Indian Country Today. Lifelong social and environmental activist Hazel Wolf is honored in a 30-minute documentary, "Voice of the Centenarian: Hazel Wolf." The 17th Sitka Symposium lets writers and scientists explore the relationships between religious traditions, sacred stories and scientific facts, June 15-21 in Sitka, Alaska. Sweaters for penguins; potbellied pig turned to pork; Audubon member enraged at ATV ads in magazines; crashing a Mormon church in Wyo. ; disguised cellular phone towers; Canadians don't want to share bears; toilet-to-tap water; anti-gun rally. Spring visitors; Tom Kenworthy visits; HCN staff transitions; bragging about our interns. With the summer shaping up to be a hot one for fires, especially in the Southwest, the Forest Service is worried about finding enough money, firefighters and also avoiding the problems that contributed to the deaths of 14 firefighters in 1994. The EPA wants to remove a dam on Montana's Clark Fork River that had been holding back contaminated mine tailings from Butte and Anaconda, and have the waste cleaned up. A look at this last winter in the West shows snow in the Northwest and Sierra Nevada, variable weather in the Rockies, and what looks like the beginning of a long, hot, dry summer in the Southwest. Pres. Clinton's new nat'l monument in CA's Sequoia Nat'l Forest; snowmobiles not welcome in most nat'l parks; Yellowstone N.P. can cash in on "bioprospecting" microbes; Clinton vetoes bill to send nuclear waste to Yucca Mtn., Nev.; Mexican spotted owls. Faced with what appear to be increased cancers in their communities, neighbors are beginning to question the way the Sierra Army Depot in Herlong, Calif., disposes of unsafe weapons by burning and exploding them, perhaps releasing toxins into the air. The deals made to get support from Sen. Pete Domenici, R-NM, for buying the Valles Caldera or Baca Ranch in northern New Mexico have some conservationists troubled that too much will be lost in the process. Critics in Congress, the media and citizens' groups are calling for reforms and more accountability from the U.S. Army Corps of Engineers. Conservationists will need to come up with $3 million to buy a 247-acre caldera near Flagstaff, Ariz., called Dry Lake, from the developer whose plans for the site were stalled by them. Residents of Nucla and Naturita in Western Colorado want to take uranium waste from near Denver and bury it in the former uranium company town of Uravan, but other Western Slope communities are fiercely opposed to the idea. Will bears get a break? As ATV and snowmobile use increases in the backcountry, Montana wildlife advocates are worried that the machines and the roads they make will harm grizzly bears. Green-labeling for forest products is becoming more common throughout the country, but not all green labels are created equal. Where were the voices of women?